The Cathedral of Notre-Dame, Former Abbey of Saint-Remi and Palace of Tau, Reims are renowned for their Gothic art and - as part of the coronation ceremony - are directly linked to the history of the French monarchy. The cathedral is one of the great French cathedrals of the 13th century and one of the masterpieces of the classical Gothic style (along with the ones in Chartres and Amiens). 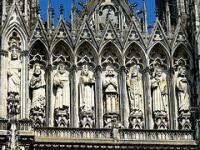 The facade of the Reims cathedral is said to have the best sculptures. The old archepiscopal Palace of Tau also played an important step role in the coronation ceremony of the French monarchy (the banquet was held there). The Former Abbey of Saint-Remi has conserved the relics of Saint Remi (died 553), the Bishop of Reims who converted Clovis, King of the Franks, to Christianity. The abbey church is a magnificent example of mediaeval architecture. Reims, including these World Heritage monuments, was seriously damaged by the Germans during World War I. The exterior of the Notre Dame cathedral was undergoing restoration at the time of my first visit (2006). Weather and pollution have taken their toll on this building: large parts of the façade (with the pretty sculptures) are blackened and dirty. The large square in front of the cathedral also is under construction. Maybe the best overall view on the Notre Dame I had from my hotel room window: I could see it bathe in the last streams of sun in the late afternoon and brightly enlightened in the night. The interior of the cathedral however is open to visitors every day. It was rather dark inside, because of the mostly cloudy weather. The famous stained glass windows (some relatively recent additions made by Marc Chagall, see 2nd pic) were like stars in the evening sky. There's also a pretty statue of Jeanne d'Arc in the far left corner. It turned out that I hadn't chosen the best date to visit these French monuments: November 11 is celebrated as a National Holiday (Armistice Day). The Palais du Tau was closed, as was the Abbey of Saint Remi. Both are museums now, and I would have liked a look inside in both monumental buildings. On my second visit I focused on the Palais du Tau. I had a quick look inside the cathedral first, and again the stained glass windows were what amazed me. The facade is still (or again?) under construction, about half of it looks cleaned now. The Palais du Tau lies next to the Cathedral. It now is a museum, holding items related to the cathedral and the coronations. The building itself is pretty modernized, and not too interesting. What I did enjoy were the many sculptures taken from the cathedral: here you can see how huge they are. The museum also holds the original pediment of the cathedral's central portal. Having visited central Reims including the cathedral and the Tau palace a few decades ago, this time around I came to Reims to see the Champagne Houses. The Champagne Houses are on the outskirts of town, so I did not plan to revisit the Reims WHS. When studying the map of the area (our France country map zoomed in on Reims) I noticed a nearby blue point: the former abbey of St Remi. First I thought this referred to another component of the Champagne site. As it turns out this is part of the Reims WHS. St Remi is the 2nd most important church in Reims. It holds the remains of St Remi, the bishop who converted Clovis (and the Francs) to Christianity. More specifically to Catholicism which at the time was competing with Arianism for primacy as Christian faith of the Francs. Although, converted may be a bit strong a word. Clovis supposedly bartered with god: "Yeah, I will join your religion. If you help me win my decisive next battle." He won and eventually he converted. With serial nominations I am always a bit reluctant on the seemingly lesser components. But in this case I was very positively surprised. St Remi may not have the Chagall windows or the Smiling Angel, but it is a very fine church with stunning stonework and windows. It also predates the cathedral. Only downside right now is that as of toady (2019) major renovations are ongoing on the church premises somewhat restricting access to the church. Reims has a TGV station a few kilometers outside of town, Champagne-Ardenne. Less frequent TGVs from Paris run directly to Reims Station in the center of town. If you travel by local train you will have to change in Epernay. Visiting the Champagne sites in Reims is a must. They are just next door to the Abbey of Saint Remi. If you are travelling by local train from Paris, you will pass through Epernay with its splendid Avenue de Champagne. The whole area is dotted with WW 1 Memorials (T). To the North lies Laon, a former TWHS, that comes recommended by my aunt. My visit to Reims took place nearly a decade ago, but the buildings recognized on this site's inscription have stood for centuries, so I expect that my impressions remain relevant. 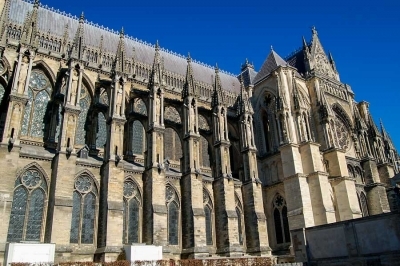 Notre-Dame de Reims, along with nearby archbishop’s palace (called Tau Palace), are inscribed on UNESCO list both for the architectural merit and for historical significance. The great church is among the most magnificent cathedrals in Christendom, well worth a dedicated visit even if you don't see anything else in town. The present structure dates from the 13th century and have been extensively restored after the damage sustained during World War I. 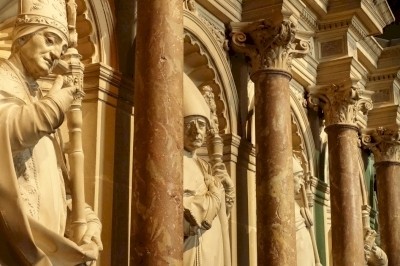 The original seat of Archdiocese of Reims existed on this site since the 5th century, when the most famous of Archbishops, Saint Rémi, first anointed a king of Franks, which gave rise to the ceremony that lasted through almost the entire history of the French monarchy. The interior of the cathedral is light and airy, and the stained glass is positively sparkling, no doubt partially due to the aforementioned comparatively recent restoration efforts. For whatever reason, Tau Palace did not leave a lasting impression with me, although the audio-guide provided plenty of historic perspective. Beyond the UNESCO site, central Reims is pleasant to stroll around and not without eye-catching architecture. And, of course, this is Champagne - including a visit to cellars around town is among the musts when in area. Read more from Ilya Burlak here. I'm not sure how many people here visit the same WHSs again and again, but I seem to be one of them. This was my second time in Reims, but this time I actually went back for Champagne. 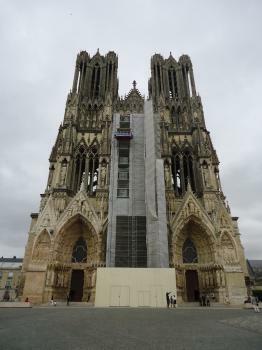 The photo shows how the Reims Cathedral looks like today. There is no scaffolding, but the fact that the top of the church is still dark means that they have not completely cleaned it yet. So we can still expect the scaffolding to reappear at some point. After seeing this cathedral again, I walked all the way to the Taittinger Chanpagne Cellar, not knowing which bus to take to the Cellar. While waiting for my tour at the Cellar, I bought a croissant and a cup of coffee at a bakery and walked for a few blocks to the St. Remi Abbey, another part of this WHS, to have breakfast at the square in front of the church. Read more from Tsunami here. 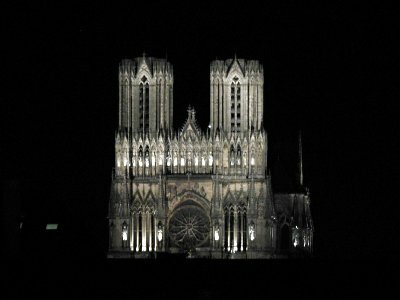 Reims is one of the major Gothic cathedrals and a memorial site of French history, for centuries the French kings were crowned in Reims. The most striking feature of the exterior is the shape of the stocky towers, the originally planned spires were never completed. The restoration of the western façade is still ongoing (September 2015), currently the central portal and the rose window are under scaffolding, but the other parts are bright and clean again. The cathedral is famous for the sculptural decoration at the façade and in the interior. 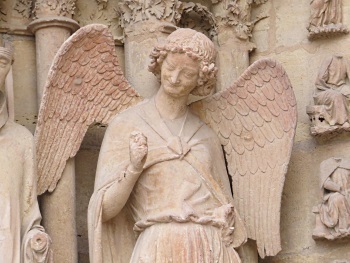 The facial expression and gestures of the sculptures are striking, most notably the Smiling Angel at the western portal. But I was most attracted by the stained glass windows by Marc Chagall. Actually, I have no particular fondness for Chagall paintings, but his style is perfect for church windows. It is a wonderful harmony between modern drawing and the ‘medieval shades’ of blue, red and green. I have previously seen his stained glass in Mainz, Zürich and Metz, but the windows in Reims have impressed me most. The neighboring Palais du Tau is also part of the WHS. The palace is associated with the coronation ceremonies, today the building houses the treasury of the cathedral, tapestries and some original sculptures of the cathedral. Not really exciting, we went rather quickly through the rooms. The third part of the WHS, the Abbey of Saint-Remi, is worth a visit. It is located in the outskirts of Reims, near the Champagne Houses. The dimensions of the abbey church would be worthy of a cathedral. The church was built on the grave of the Saint Remi and the tomb in the choir dominates the interior until today (photo). I liked the interior even more than the cathedral: the plain and unadorned nave, the arcades with round arches and the slender columns. Reims is a worthwhile destination for WHS enthusiasts: two WHS in the city, two sites of the Santiago de Compostela WHS and numerous WWI memorials (TWHS) in the vicinity. However, I found the city not very attractive, apart from the WHS there was nothing typical and distinctive, many cities on our trip through northern France were far more interesting and charming. Just visited (July, 2015). Currently the cathedral is under restoration (scaffoldings hide rosette of main portal). Located nearby the Palace of Tau is closed on Mondays but it is possible to visit the Museum of Saint Remy (former Abbey of Saint Remy, also part of UNESCO heritage). As in most of French churches the entrance to the cathedral (and St Remy basilica) is free of charge, although for the museum you should buy a ticket (if wanted to see interior of former abbey - worth visiting). I visited this WHS in June 2013. The cathedral's spiritual, religious and historical importance justifies it being on the list. Here, General de Gaulle and Chancellor Adenauer set the seal on reconciliation between France and Germany on 8th July 1962. The Former Abbey of Saint-Rémi did not impress me as a site of universal value while the Palace of Tau gave me a more in-depth overall experience. The sound and light show is really the cherry on the cake and is much better than the one organised in Strasbourg. Reims is one of the most important cities in French history, and if you are only slightly interested in this subject (maybe slightly confusing but very interesting), then this city is a must. 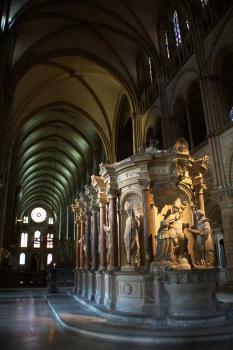 It was the site of over 30 coronations of kings of France, beginning with Frankish leader Clovis (Chlodwig) being christened by bishop Remigius (Rémy) in the 5th century, becoming the first Christian king of France. The cathedral is a real masterpiece of Gothic art from the 13th century, and the former palace of the archbishops, the Palace of Tau, merits a visit as well. The basilica of St-Rémy contains Rémy's tomb and a collection of fascinating 12th-century stained glass windows. There's also a cryptoporticus, showing remains of the Roman Forum. All in all, a fascinating place to visit and very important historically, architecturally, culturally, and religiously. 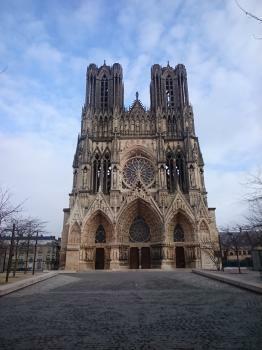 The Cathedral and the Palais du Tau are right in the city center of Reims, a sizeable city in the North East of France. The Abbey of Saint-Remi lies some 25 minutes walk south of the other two locations. John D Rockefeller Jr: Rockefeller was major funder of the cathedral's reconstruction after its destruction in WWI. The main street in front of the Cathedral has been renamed "Rue Rockefeller"
Charlemagne: Palais du Tau holds the "Talisman of Charlemagne", buried with him at Aix-la-Chapelle, in 814, and re-discovered when the tomb was opened by Otto III in 1000. The talisman was then preserved in the treasury of the Reims Cathedral. Joan of Arc: Charles VII was crowned in the Cathedral on July 17 1429 in the presence of Joan of Arc. Built in the 13th century: Of the 3 inscribed buildings,the Cathedral, built on the site of an earlier one destroyed by fire in 1210 and finally roofed in 1299, is the most significant "jewel" as stated in Crit I .... "By virtue of the outstanding handling of new architectural techniques in the 13th century and the harmonious marriage of architecture and sculpted decoration, Notre Dame cathedral at Reims is a masterpiece of Gothic art." "The monastic buildings date from the 12th-13th centuries, but were extensively remodelled during the 17C"
299 Community Members have visited.